When Rob was in hospital I kept a diary of events on how Rob felt and the treatment he underwent. March 16th 2007 – Friday Mum took me back to the Docs, I told him that my knees ached, and on this basis, the Doc said it is possibly the end of the food poisoning, on the basis of the symptoms I had given him. March 17th 2007 – Saturday Still bad, I have to wait till Monday for blood test results. (I couldn’t bear it any more as Rob came down and was really upset, and could not sit still, he looked 6 months pregnant, I looked at his stomach and could see that it was not right). Dad took me to Wycombe Hospital, around 10.30pm and asked that a Doctor would check me thoroughly, and wanted some concrete answers, (Rob had been through enough!!). The Doc examined me and noticed that my Prostate gland was enlarged, and they decided to admit me to Wycombe Hospital, it was 2am. March 18th 2007 – Sunday (Mother’s Day) Mum and Dad came hospital and I realised it was mother’s day, and apologised, “Not a good mothers day prezzie, sorry mum”. I was upset and did not like having company and I asked if Dad could stay the night, with me. (This was to continue throughout Rob’s treatment) I had a pizza and some mash, not the best diet, but was later sick, still bloated and very uncomfortable. March 19th 2007 – Monday I had a scan today and I was given Morphine tablets for the pain. March 21st 2007 – Wednesday I was transferred to John Radcliffe Children’s Hospital, in Oxford, (Melanies Ward – Room 9), at 8.30pm by Ambulance. I was in a lot of pain by the time i arrived, I was put on a ward, but later transferred to (my bedroom), Room 9, on Melanie’s Ward. It took a long time for a doctor to see me and my Dad was not best pleased! March 22nd 2007 – Thursday Was taken for a biopsy under local, and then more waiting!! ………. March 23rd 2007 – Friday Today I had a drain fitted on my right side, under local. I had a lot of “Acetis” fluid in my abdomen. When the drain was fitted, fluid gushed out and I was losing 3 litres per day, they had to juggle with the fluids coming out and putting some back, so my body would not go into shock. Felt a lot better, not so bloated. March 27th 2007 – Tuesday I went under General Anesthetic today to take a larger biopsy, using keyhole surgery and to put a Hickman Line in, this had to stay with me whilst having Chemo treatment, (at this stage I or my parents did not know what it was for, just guessed it was to administer my Morphine). When I woke I had a cut to my neck for the Hickman Line, three cuts in my abdomen for the biopsy and another drain on my left, (to even the flow of fluid). I now have seven incision to my abdomen. “I look like Pinocchio!” Still, I know it is for the best. March 30th 2007 – Friday I was worried more for mum and dad; I had already guessed it was Cancer. (As a parent, being called into another room, and to be told the devastating news our son had Cancer, was the worst day of our lives, what and how do we tell our son?!) Once the Consultants had confirmed Rob had Cancer, Chris thought it best to tell Rob as it is, so he went and told him, I was too upset to face him at that moment, I do remember saying to the Consultants, “Please save Rob, I can’t lose my son”. The Consultants continued with the fact that Rob had Cancer. They did confirm that it was a rare and stubborn Cancer, and yet to confirm the name. Dad came into my room looking upset, the nurse was washing my hair at the time, dad confirmed to me it was Cancer, and although I had a good guess, the news shook me to the core. (I know this was to be the hardest thing my dad would have ever had to face, telling his son he had Cancer), I looked up at the ceiling my face blotchy from holding back the tears, I did not want to talk, then mum came in, I could see she had been crying, she did not say anything, she took over washing my hair. I said “I don’t see the point; it’s going to fall out anyway”. (Rob was right; suddenly his hair was so important to me, so beautiful. I know Rob treasured his hair, and he was going to lose it!) I did not look at mum or dad for some few hours, just looked at the ceiling, nobody talked, just in deep thought! April 3rd 2007 – Tuesday I was transferred back to Melanies Ward R9. Good to see all the nurses I had been with before – My nurses, Stu and Rob are great, they would both come in and have lengthy chats, Rob would be very gentle with me, helping me wash, and Stu would stand at the end of my bed and listen to anything I wanted to say! They all seemed so excited to see me and would argue who would look after me, still they all came in and asked how I was doing and that they missed me. I missed them! April 4th 2007 – Wednesday Uncle Nige turned up to cut my hair, armed with cutter and razor!!! I felt quite well, a bit sad that my hair is going, but having Uncle Nige to cut it makes it bearable. Nige is also shaving his hair off and I AM DOING IT!!!!! Well I have had a grade 1.5. Now for my turn, cutting Nige’s hair was great fun, made me forget for a second! Mum got hold of the razor and shaved Nige’s head bald, I wanted to do it but my hands were a little shaky. (NOT A GOOD IDEA! ), He looked mean, like a real villain!!! It is good to laugh again!!! April 5th 2007 – Thursday I ate an ice lolly and was very chatty today. I also attempted a cuppa, having something warm felt weird. My night was the first with no pain. I did talk in my sleep, (mum said), saying i have to go to every toilet in the hospital and mum has to take me to the library – oh wonders of Morphine! April 6th 2007 – Friday Grandad’s Birthday, Steven and I bought him a top; he likes it and puts in on the next day. Having a scan, I may have a kidney infection. I was very upset, more upset than when I go told I had Cancer! My immune system is at its lowest (Neutropenic). Mum and Dad bought me a PSP and all its accessories, I was stunned, but mum says the look on my face and the smile was well worth it! April 8th 2007 – Sunday Auntie Kath and Uncle Mick came to visit today. Grandad (as every day), visited and Uncle Nige and Auntie Sarah too. Managed to keep the pain as bay!! April 9th 2007 – Monday Having Platelet Transfusion today, looks a funny colour (like straw). I had a small reaction, like hay fever, itchy nose and sore eyes! April 10th 2007 – Tuesday I had my drains out today, mum and dad were not around, Nat (my nurse) was assisting in removing them, but because I was crying, she was very upset and could not do it. She said the doctor had to finish. (It’s not nice to see a young man crying). Dad was not happy, as he would have wanted to be there! April 11th 2007 – Wednesday Blood transfusion today should get some colour back in my cheeks. April 12th 2007 – Thursday I walked to the corridor today it was great. But I just wanted to get back to the comfort of my bed! April 17th 2007 – Tuesday Walked to the day room and straight back to my bed, again!! April 18th 2007 – Wednesday Had a bone scan today, which was clear!!!!! April 19th 2007 – Thursday My second Chemo today. It’s a shame, I feel so good, I know I am gonna feel like crap soon!!! April 21st 2007 – Saturday Got weighed today and I weighed 60.3kg (9 stone 4.5lb). Been very sick today, I have had a loss of 2.5 stone since being ill.
April 24th 2007 – Tuesday Today is a big day, the day I have gained some strength and the doctors have treated me so it will be right for me TO COME HOME!! Oh, I am so happy. But first I have to climb the stairs and this made me sick, it was very hard work, but the thought of coming home, gave me strength. I came home at 2.20pm; I was so excited to return, greeted by my neighbours. I walked in, helped by my Dad, and saw mum with a video camera, and I saw a beautiful bike, that Mandy and Chris (mums friends), bought me, Wow, it’s great, I just want to sit down and have a drink, sit on the sofa, and watch Kerrang, it’s great to be home!! Mum and dad kept saying to me to see my fish tank, I did not want to rush, but they kept insisting. As I walked into my bedroom, I was so amazed to see my bedroom all decorated, I pointed at the walls, lights, TV, carpet and computer, lost for words, sat on my bed and said, “You didn’t have to do all this, black and grey and chrome, wow! I will have to go into hospital more often”, then I asked dad if I could go on MSN as all my friends will be home at 4.40pm, can’t wait!!! Later I had a cry on my dads shoulder for a good 10 minutes, just found it overwhelming, that so much has been done for me!!! April 26th 2007 – Thursday Went to Wycombe Hospital to take bloods as I am Nutrapenic. Wanted to get back home, I was starving. When I returned home I ate beans ‘n’ sausages on 2 slices of bread. Mr Jones, Miss Burns, and Mrs Townsend, visited me, who would believe, my teachers sitting on my bed!!! April 28th 2007 – Saturday Uncle Nige and Auntie Sarah came to visit. We ate chinese, but I was not feeling too good, sore throat, later I requested mum and dad take me to hospital, as it was getting very sore, and I couldn’t swallow. Arrived in Wycombe Hospital at around 8pm, don’t feel settled there! Had a rough night, it took 12 hours to get my pain relief sorted. Being transfered to JRH. April 29th 2007 – Sunday Transferred to JRH by Private Ambulance, much better ride, mum came with me, was telling the driver the quickest route, he disagreed, it made me chuckle!!! When I arrived, they instantly had everything ready, and I felt much more comfortable on Melanie’s Ward, my room 9!!! April 30th 2007 – Monday Took swabs of throat and said I have Mucusitis, (this is ulcers an inch long at the back of my throat), I can’t swallow my own spit, I use a box of tissues every hour. Later I had a Platelet transfusion. My nutrafills were so low, they could not be detected! My body has lots of fluid now! Had an x-ray of my lungs and that was clear. May 1st 2007 – Tuesday Had a good night sleep. Had another blood transfusion, feeling much better, still not swallowing. Had English course work to complete, which the hospital teacher, Ann, went through. I sat up and used the hospital laptop. Ann was very patient with me, pausing whilst I was sick on the odd occasion, but I was determined to do my studies. Dad started back at work, mum is staying with me. Diane, the Art teacher turned up with some clay and asked if I wanted to make something. I was not sure, as I felt my art was not my best subject. She talked to me for a while and discovered my love for rugby, and she was doing a subject called “Waiting”, and that making a scrum would be a symbol of that. Also Diane asked me to write a poem and paint a picture of how I am feeling, with “Waiting” in mind! (I left Rob alone with Diane. He felt a bit shy and I wanted her to talk to Rob. When I returned, Rob was underway with the making of his now famous, “Scrum”). Boy that was fun and passed time!!!! I could not wait for her to return to finish my scrum! My weight was 56.4 Kg. I ate a piece of chicken and some pasta, before they put my TPN line up. This is a white substance that gave me all the nutrients and vitamins; this was fed through my Hickman line. May 3rd 2007 – Thursday I was very busy today making / finishing my scrum out of clay. Diane said she will get it cast in Bronze so I am keeping it for a surprise for Grandad. I had a high temperature of 38. My weight is 57.7kg (9st 2lb), my height is 166.2 (5′ 5.5″) I GAINED 4LB!!! Feeling and looking much better!! May 4th 2007 – Friday Having scan of kidneys, will take about 3 hours. Pat is coming down, looking forward to seeing her, she is staying over at the hospital. (So I guess mum and pat will be like bookends, drunk no sorry, merry). I had a nose bleed for 3 hours, what a mess. After passing some big clots, it stopped, so quick, you never would have believed I ever had a nose bleed. Dad, mum, Pat, Steven and me had a curry in my room, I attempted most of the dishes, that was fun. May 6th 2007 – Sunday Came home, on the condition I will drink!!! May 7th 2007 – Monday Dad upset not drinking enough, was taken back in and rehydrated. I thought, “Sod it, may as well drink and eat and not worry if I am sick, if I am, then fine” Actually, I felt much better, just afraid of being ill.
May 8th 2007 – Tuesday Went home determined to have a good 15th birthday!!! My hair was a mess so I asked dad to shave off completely, instead of that he had a fab idea of taking my hair off with ‘masking tape’, it didn’t hurt, tickled, but I looked real cool now, and I did not care being bald, wanted to start a new trend!!! May 9th 2007 – Wednesday MY 15th BIRTHDAY!!!!!! Mum made me a brilliant cake. It was a KFC twister. Mum, dad and Steven bought me Billabong clothes, Uncle Nige and Auntie Sarah bought me Vans and I had lots of visitors. Friends, Mr Gilbert my head teacher, Miss Townsend, mum’s friends. It was a great day, I felt really well and It was nice to be home with everyone around. My friends left at 10.30pm. May 10th 2007 – Thursday Chemo postponed, no beds. Typical NHS! Feel upset as I set myself up, just want to get it out of the way! 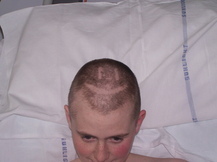 May 12th 2007 – Saturday Went in to JRH – Kamran’s Ward at 1pm for chemo. This time I was rarely sick. Dad stayed the two nights. I couldn’t sleep, I went into Melanie’s Ward to watch DVDs and I was up till 6am. The nurses came and kept me company, asking if I was ok and I should get to sleep, but I feel great!!! Dad woke and could not find me. I think he was a bit shocked I was up, and in another ward!!!! 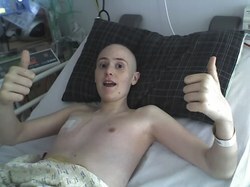 May 14th 2007 – Monday Came home as soon as my chemo finished, could not wait!! May 16th 2007 – Wednesday Had to get District Nurse in, being sick a lot. Had anti sickness tablets, feel much better, bloody hungry, mum left Steven with me and went to town to get me my favourite KFC Twister meal – only to bring it up an hour later, “Sorry Mum”. May 21st 2007 – Monday Oh dear!, woke up sores in my mouth, finding difficult to swallow again, (Mucusites). Mum phones DN, not wasting any time, went straight to JRH. May 23rd 2007 – Wednesday Sores real bad, platelets down to 9 need platelet and blood transfusion. Temp up to 38.4, morphine is up to 5ml, can talk but not swallow. This is the worst I’ve been, all but the Acitis. May 31st 2007 – Thursday Came home after a long stint. Feel good, glad to be home. June 5th 2007 – Tuesday Gone in for third Chemo, this time for 5 days, feel a bit apprehensive, dad is with me mum attempts work. This chemo I cannot leave the bedroom, I felt very emotional, but at least it gives me a chance to read all my books!!!! June 6th 2007 – Wednesday Saw mum, felt upset, wanted to go home. Sleeping all day, on valium to stop me being sick, works but I sleep. June 8th 2007 – Friday Mum and Steven come for weekend. I cried, wanted still to go home. Doc talking about putting feeding tube into my abdomen, which I want as I hate the feeding tube up my nose, it irritates me! I am feeling very dizzy. in pain, very sore. Mum took a picture of me minutes after returning to the ward, to send to Pat & Rog, to show how happy, and relieved I was, as I know, like everyone, they were worried. As the operation was rather complicated, the feeding tube was so close to the big tumour. June 15th – 2007 Friday Because I am still in so much pain from my op, I am having a CT scan to see if I have any internal bleeding. Doc came in and asked to talk to mum and dad. Why?! They should talk to me!!!! They said that my tumour has not shrunk and that I will have to have another CT scan on Monday. June 17th – 2007 Sunday Mr Gilbert (The Head teacher), Miss Burns, Mrs Lindsey, came to visit. I was quite amused by Mr Gilbert’s appearance, as he was in casuals and I have never seen him dressed so casually. Watch DVD school had done, made me laugh, especially seeing Mrs Boyd in slow motion, very funny, not sure she felt the same. Thanks HGSS!!! June 19th – 2007 Tuesday My little brothers 8th Birthday. I bought him a Portable DVD player. Dr Mitchell came into my room and asked if I want him to talk direct to him, I said “yes”. He told me the tumour has in fact grown, the chemo is not working, and he will look for more answers. Also the Acites has returned. I am totally shocked, I look at mum and we both have a cry. Dr. Mitchell felt upset and left the room also upset. After studying the scans, it looked like I have a cyst inside the big tumour had formed and needed to be drained, yet another tube in my abdomen! Boy did it drain, very painful, under local, but hopefully this will make me feel more comfortable. June 20th 2007 – Wednesday Dr. Mitchell came into my room and looking rather pleased, says he was happy with the way the tumour had drained. He now feels perhaps the op to put the feeding tube in, irritated the tumour, causing it to swell, hence the extra fluid. I will have another CT scan on Tuesday to see if it is the tumour or just extra fluid. I pray to God it will be ok!!!! June 27th 2007 – Wednesday Had my results to me CT scan today. Dr Mitchell said the tumour has in fact stayed the same. Oh well, that’s something, at least it has not got worse. Feels good not being in any pain, my abdomen looks like a robot all tubes. Hickman line / Gastomey / Drain. Going home tomorrow!!!!. The docs have changed Protocol to time my homecoming to co-inside with the “HGSS Fundraising Day” that everyone has been working so hard for, Miss Burns in particular, having sleepless nights. Thinking of this day gave me extra strength. June 28th 2007 – Thursday Came home today, glad to get out, what a journey it’s been!! This is the day I had been focusing on and the Consultants and been hoping I would attend. HGSS FUNDRAISING DAY IS HERE!!!!!! What a day!!!! !, I walked in front of the school, taking Mr Gilbert by surprise, as he was expecting me to come in through the back and have a quiet entrance. But no, in my nature, I disrupted the school, again!, sorry Mr Gilbert!, I guess I will get a green form when I return!! I did not want to go in my wheelchair, I got out and walked, mum followed closely, in case I could not manage it. I walked in the rear, and the cheers and clapping was overwhelming, everyone was crying, I didn’t know I was liked that much. The entertainment from all my teachers and friends, was hilarious, what a day, and for me, unbelievable. The fundraising went on and raised just over £6,000 for my Charity. When I returned home, my head was badly sunburnt, and I was up being sick all night, guess in might be sun stroke. Mum gave up popping in and out all night and decided to lay down on my bed, with sick bowl in hand. June 30th 2007 – Saturday Feel like crap, asked dad to take me to Wycombe Hospital. They kept me in overnight, didn’t do much, wished I hadn’t gone in. June 31st 2007 – Sunday Steven’s 8th Birthday party at the bowling in Maidenhead. I phoned Grandad to pick me up and bring me home, much to the suprise to mum and dad. July 1st 2007 – Monday 10.50am In a lot of pain in my side, feels like I have pulled a muscle, dad takes me to Wycombe Hospital, as JRH have no beds available. Later around 3.45pm I was transferred to JRH via ambulance straight to Melanie’s Ward. July 3rd 2007 – Wednesday Had CT scan of my abdomen to try and see what the problem is, as I had a full bone scan yesterday and that was very painful, I had to lye still and flat on my back, was given a sedative. The results were clear!!!. Transferred to Kamran’s Ward. July 5th 2007 – Friday Dr Mitchell shows mum and dad the CT scan of my abdomen, to reveal the tumours HAVE grown, and the pain I feel is that of a new tumour and it may be pressing on a nerve up in my ribs. I know something is wrong as mum and dad seem very upset. When they tell me, I just feel very disappointed. When grandad turns up, I calmly say “I’ve got another tumour”. (Rob always seems to shrug his shoulders and take it upon himself, god if only we could have his strength). I am in so much pain, my morphine is at a background of 4 and a bolus of 2, I have gas & air, and oxygen! (This was never to leave Rob’s side). I have to go to the Churchill for some radiotherapy sometime this week, to zap the bugger. July 12th to 16th 2007 – Thursday to Tuesday I start 5 day chemo, half hour per day. I have had no sickness, very very hungry. I put on nearly a stone. I am now 57kg. During my chemo on Saturday 14th July I had a dose of Vincristeen, and two weeks today I will have my 5th chemo. Pain is more controlled. Yesterday mum attended a funeral of a little boy called Nickil, he was 10 years old and had three types of cancer. Mum went along to support his mum Nina and brother Aaron. July 20th 2007 – Friday Had Radiotherapy today, not too bad, it only took 3 minutes, and 5 hours getting me to The Churchill and back!!! As I had to transferred by Ambulance and had to be sedated to control pain, plus my Entinox went with me. Left me very sleepy and I had to have no food, so by the time it had finished I had not eaten for 36 hours. Dad went and got me a KFC, I will eat it if I wake up………….. Wow enjoyed my KFC. See how that affects my bowel Ha! Ha! During this month, I was presented with my bronze sculpture, unaware it was the finished sculpture, IN BRONZE!!! . Grandad, mum, dad and Steven were there, Diane (who worked with me on the sculpture), came in, very proudly placed the sculpture on my bed, I was lost for words. It was beautiful, and a bit emotional that this was done for me!!!! 28th July 2007 – Saturday Starting the 5 day half hour chemo today on, “Irotican”. Still in pain, lowest on the pain chart is 2, most is now 7 getting better slowly. Had my dressings changed, I look much cleaner, mum massaged my feet with cream to stop them from cracking. 13th August 2007 – Monday Having an injection today to numb the nerve pain, if that works, they will give another injection to kill the nerve completely!! Pat, Lisa, Ben and Pats Neighbour, visited, seeing me in pain upset Pat. They all left the room whilst I had the injection, mum and dad stayed with me. That injection was a miracle, the pain has completely disappeared, I said, “Can I go home now”! !, the consultants told me that it will only last four to six hours. When Pat and the crew came back in they saw a different person, “No pain”, I said, I got out of bed, very weak, I walked the corridor, walking up straight for the first time. Everyone was crying with emotion, I am Rob again. Even the consultant Rudy, when he came in, smiled his big smile and his eyes all glassy, couldn’t believe it!! I had been in pain for 6 weeks!! Now I can play my Guitar Hero properly. The results of my previous scan revealed, my latest tumour had disappeared, due to the radiotherapy I had received a few weeks ago. All the others had stayed the same. My next chemo is next Saturday. 17th August 2007 – Friday Had an X-ray of had to show my age for the new hormonal treatment. This treatment is instead of chemo, as Dr. Mitchell seems to think the chemo is not working. He said about giving these hormone drugs, as they think my hormone growth is feeding the tumours, and by stopping me growing, then hopefully the tumours will do the same and even shrink, this IS a test, I hope to god it works, then they talked about perhaps removing the tumours. I had a little chat whilst mum was out with one of the day care nurses, that often chatted with me, and bought me anything I wanted. When mum returned, we had a little chat. (with the help from my nurse), I felt that if the hormone treatment did not work, then I had decided to have my Hickman line out and go home. Mum looked shocked but replied, “If you have your line out, then you won’t be able to continue treatment”, “Yes, that right” I said. “You know what that means?” mum continued!! “Yes, I will die!!!”. (I think from that moment on, Rob knew what he wanted, and knew the outcome, like he always said, “It’s my cancer and I’ll deal with it”) I just signed and said, “OK”. 20th August 2007 – Monday Started hormone treatment. (A tablet and some liquid). Better than chemo! I feel terrible today, still have that stinging pain, can’t rest, keep being sick. I have to ride out the pain. The MRI scan revealed nothing. Let’s hope tomorrow is a better day?!! 21st August 2007 – Tuesday Had CT scan of brain to see if there was any abnormality (apart from my normal brain that is!!!!!) It came back clear. They are talking about a sedative to make me drowsy so I don’t feel the pain. 23rd August 2007 – Thursday Dr Mitchell gave bad news today. Told mum and dad they would have to sedate me, or I will continue to be in pain. He said the tumours feel like they are growing. I will have a CT scan on Tuesday. (The consultants feel it’s in Rob’s best interest to make him comfortable to go home. We did not want him to know that things were not going right. This is hitting home a bit too quick and too hard for us to take in right now!!!! !, we even discussed if Rob was to stop breathing, not to resuscitate, as its not fair on him. Rob is losing his battle to fight this cancer, we would love him home, but feel his getting the best whilst in hospital, and he feels like it is his own bedroom). The drugs are taking their toll, Rob is hallucinating, he would say shush! !, there is a black lab on my bed, when it was his black cushion. He would see an old man walking past, and tell us, “He’s a bit grumpy, he is on his way to the Infirmary, and a thin lady writing something. Sometimes Rob was amusing, but often it was very disturbing to see our son becoming someone else! he would have bad visions, such as water, and things flying out at him, he even got out of bed and was waiting for a taxi to take him home. On another occasion, Rob fell out of bed getting a drink, and collapsed, boy was he bruised. That was it, we wanted our Rob back, pain and all, I am sure Rob would feel the same!!!!!! 25th August 2007 – Saturday Spoke to Dr Wheeler, and she agreed with Dr Mitchell, that the sedation should be taken off, even Dr Wheeler was upset to see Rob so drowsy, looking through the slits in his eyes. Rob, out of that comatose state. We have Rob back, but at a price, Rob is in a lot of pain, you just don’t know what to do for the best! 28th August 2007 – Tuesday I had a CT scan, not good, my tumours have grown, that will explain my pain, they are pushing on my kidneys, I ask Dr Mitchell what that is poking out of my side, (because I wanted him to talk to me honestly whenever I ask him questions), he simply replied, “That is the tumours growing”, I look at mum and dad and shrug my shoulders, have a deep sigh and simply say, “OK”. No more was said. Dr. Michell called Chris in a room, I was attending my Slimming World Group, and broke the news no parent wants to hear. “Rob has two weeks to live”. As I look at our son dying, I wish for many things, I want his life back, back to being the fit and funny boy. Rob has given us 15 years of bliss, such an easy boy, even now he says sorry for being too much trouble, and pleases and thank you’s. The question is telling him?. We don’t have long, I spoke to Chris about what to say if he should ask ‘Am I going to die?’ and we agreed to say the tumours have grown, and they are looking at more treatment, do you want to go home in the meantime? We can’t tell Rob he is dying, his last days will be filled with sadness rather than hope!!!! Although, when the consultant said the tumours were growing, Rob knew then, he was dying, and in his usual way, never put us through that torment, of asking us that dreaded question! Always thinking of others, that’s Rob!!!! 29th August 2007 – Wednesday Not a bad day, morphine background, set at 6mg. Pat and Lisa came that was nice. Mums friend Mandy visited, and Paddy visited again, so many visitors in one day, I can sense something is wrong, still I am happy seeing all my friends. Yesterday, my friend Lei came to visit, I used to play Rugby with her after school. That why Rob was so muddy !!!! !, mum just smiled. Lei gave me a teddy with I love wasps and some newspaper articles of “Wasps”. Thanks Lei!!! 31st August 2007 – Friday I’m quite happy sucking on my entinox, when I see two wasp players walk in, carrying the Heineken Cup. Wow, it was cool, but my heart was racing, Thanks to my teacher Miss Burns, it made a dream come true!!!! 1st September 2007 – Saturday I asked my dad to call one of my best pals, Chris Harrison to visit me. Then later, Chris, his sister and his mum (my second mum), walked in, I was very happy to see them. Karen (Chris’s mum) said she would bake me a pizza, she made the best!!! I did not have an appetite, but it was a lovely thought. My hair was now the same length as Chris’s, but mine is much softer. Watched horror movie with mum kept doctors away and me off the Entinox!!!!!!!! 2nd September 2007 – Sunday Today the guys do the first parachute fundraising event, the parachute jump, I have written thank you cards. (When they had jumped they were so excited, they wanted to talk to Rob, but he slept all of the morning, I whispered to him they had jumped and he put his famous thumbs up). Later, Jayne and Louise visited, I teased Louise about going back to school. Ha! Ha! Grandad came for his everyday visit, sat with me whilst mum and dad joined Blockbusters. They hired me 4 videos, Norbit, Paranoiya, Scream 4 and Jack Black. Later, I watched Tenacious D with Katherine, one of the nurses, she sat through the whole film with me, then mum and dad watched Scream 4 with me! The other two films I will watch tomorrow. I ate a small tub of Baileys Ice Cream, I loved it!!!! When it was time for Steven to go to bed, he gave me a lovely hug and I stroked his cheek, ahh! !, sometimes Steven can be so cute, I gave him a kiss, I do love you!! 3rd September 2007 – Monday Didn’t give mum too much sleep! I woke up at 2am asked mum what those prezzies were, she reminded me , they were a gift from Lei, I forgot. I wanted mum to get the mag out and show me, and read all the newspaper article out, as I could not see properly, nor did I have the strength to read, plus I was shaking. Mum did not know what she was reading, so I kept correcting her! She even tried to skip bits, like she used to do when she read me a bedtime story when I was small. And because of that I made mum read ALL he article, even what number they were and the score. ANYWAY!!!!!!!!!!!! (This is what Rob would say, if you went on a bit!!!!). When mum finished reading I asked her to sellotape it to the cupboard, that better, now I am happy. The time was 3.45pm, mum went to sleep, I just sucked on my entinox, looking at her. Called mum at 5pm to get me up for, (No.2), mum stayed awake, the nurse made her a cuppa!!! (Rob finally nodded off at 7.30am – 9.20am Rob woke me saying “Where’s daddy kins”, I said in bed. You see Rob got a bit confused with the time and whether it was day or night!, every time he asked the time, he would ask if that was day or night). “They gone to bed early”, Rob said, “No, its morning you dafty date!! !”, “Oh” . 11.30 dad came down with Steven, I was please to see them, I gave Steven a hug and kiss and dad the same. Dad would sit to my left and hold my hand and watch my TV – Cooking!!!!!! Steven would go into Melanie’s Ward and play the PlayStation. Dad went to Bristol to see his dad, he did not want to go, I made him, it was OK, I slept for most of the morning. Pat could not come down due to various reasons. She phoned and told mum she will be down tomorrow!! Gemma, the hospital Social Worker – mums coffee mate!, popped her head round the corner, and said her famous “Coffee!!?”. (You see, we did not want Rob unattended, due to him making a dive out of bed again, so I wanted to wait for GD. Although Rob was sleeping very heavy. I asked Gemma to sit with Rob, whilst I made a phone call to Steven’s Head teacher Mrs Virk, to tell her the bad news. Gemma did not mind, as she felt like a proper sitter, eating sweets, reading the mags and lying on the sofa!!!!!!!!) When GD turned up about 3.30pm he sat with me, I was glad to see him, whilst mum and Gemma went for their coffee, at least I was awake and had a little conversation with GD. Dad returned about 6.30pm and sat holding my hand. At 7.50pm, Uncle Nige and Aunt Sarah, turned up. I was tired but managed a conversation and a smile. Grandad decided to go around 8.30pm, he said goodbye. (GD knew he would not see Rob again as his Oxygen levels were too low!!!) Nige and Dad go and get an Indian takeaway, I didn’t feel hungry, but I didn’t mind them eating. Nige and Sarah watched “Norbit” with me, very funny film, watching an overweight person trying to fit down a water slide made me chuckle. Aunt Kathy phoned saying she will be down Wednesday with Cuz Katie. Mum said I was doing fine, talking and laughing with Nige, not in too much pain. 11pm, “I feel really tired now”, I said to mum and dad. This was the last time Rob spoke to us, we stayed with him as things were a little unsettled, Chris settled Steven in a bed on the ward and I slept with my head on Robs bed, holding his hand. 4th September 2007 – Tuesday At 2am, Chris woke me, as Rob was deteriorating. Rob passed away peacefully 10 minutes later. Our son’s suffering was over. THANK YOU FOR TAKING THE TIME TO READ ROB’S JOURNEY. I DO APOLOGISE IF I HAVE UPSET ANYONE IN WRITING THIS ARTICLE. IT HAS BEEN VERY EMOTIONALLY DRAINING FOR ME TO REWRITE ROB’S DIARY BUT I WANTED YOU TO GO ON ROB’S JOURNEY TO SEE HOW INCREDIBLY BRAVE HE WAS IN DEALING WITH THIS DEADLY CANCER AND HOW IMPORTANT IT IS FOR US TO RAISE THE MONEY AND KEEP RASING FUNDS UNTIL A CURE IS FOUND. ONCE AGAIN WE WOULD LIKE TO THANK YOU FOR YOUR KIND DONATIONS AND SUPPORT, BECAUSE WITHOUT YOU THIS WOULD NOT BE POSSIBLE. PLEASE KEEP THE MESSAGE BOARD ALIVE, IT GIVES US COMFORT TO KNOW YOU STILL CARE.